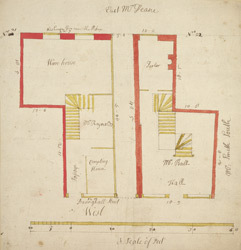 This is a plan of a shop, the names of the tenants and neighbours are recorded. A note referring to pages in a book probably refers to an accompanying record book of tenancy agreements. Basinghall Street derives its name from the Basings, a wealthy and influential 13th-century family who owned a house there.